After a march to the top of the hill. Looking down from Meikle Ross to the bay, farm steading and cottages. Lovely summer sunshine. That view again, just ‘cos I like it! 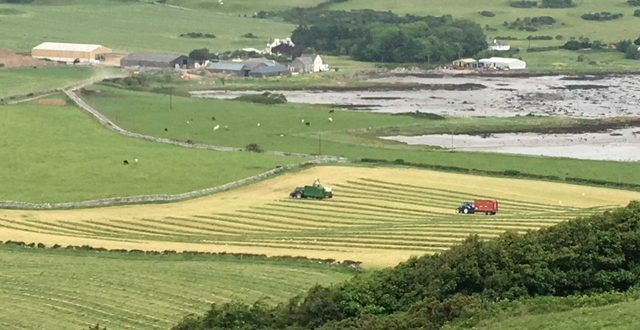 Just another picture of the silaging this time as we really like it. It captures the flurry of activity which is there and then no sooner gone. 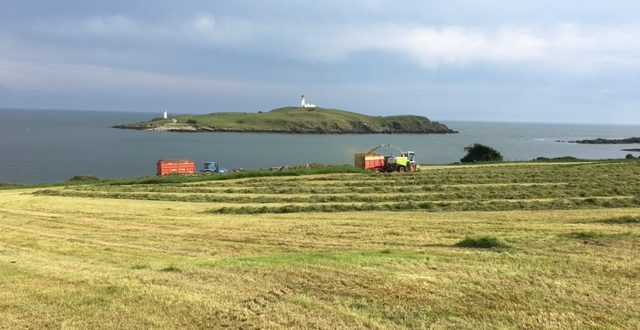 Ross island in the back drop, us tractor drivers need to concentrate on driving and not viewing otherwise we will soon be seeing the sea to close!! Galloway Children’s Festival 25th June 2017. The view from the office in June! The view of the bay. Imagine our surprise when we saw a new born lamb in the field in late May. The young mum is so proud and protective. They run quite fast out of our way, lamb hugging mums side as the talk to each other. The sheep are enjoying their grazing and not too impressed by our presence on the hill on the quad bike, requesting a pose for the camera! Sheep shearing all done for 2017.